When creating attractive displays, presenting your brand on signage, and getting the word out about your business, the product used to display your message can have an immense impact on the success of the message. Through our network of industry leading print suppliers we have access to the largest variety of printing materials and processes available. Do you have a great marketing idea that requires an unusual printing application? MLB Can take your idea and find the best print suppliers, process, and materials to make your idea a reality. When Adbloc Media had difficulties securing a supplier for a unique advertising placement on ski-lifts they turned to MLB Print Management who tested results from several of their existing suppliers. Not only did MLB Print Management identify a supplier with a unique process that produced a superior final result, but we proactively completed some pre-assembly and facilitated shipping to the resort locations. Going to a tradeshow? Need to make a good first impression with your marketing pitch? 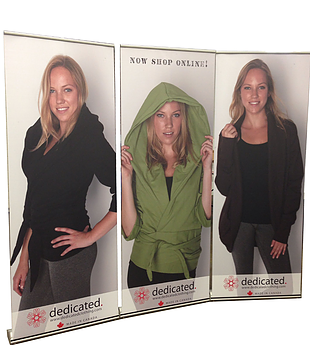 We have produced a variety of different reatractable banners for many of our clients. We only use the best quality hardware and materials to produce our banners, and we guarantee you will love the product we bring to you. A local realtor was looking for a way to promote his services in a unique way that would benefit the people in his neighbourhood. MLB Print Management sourced a supplier for Paper Lawn Waste bags printed to promote his real estate services. For his clients (and future clients) the lawn waste bags were a refreshing and useful departure from usual mailers, and for the realtor not only were hundreds of his “lawn signs” all over the neighbourhood, but our seamless service and door-to-door delivery let him stay focussed on his clients. We ensure that no matter what your need, not only will we suggest the most appropriate product to meet your needs but we’ll often be able to recommend solutions that a standard print shop won’t be able offer. Foamcore, Coroplast and Sintra boards have become a favourite of many of our clients. Sintra is a fairly new product that is durable and have the rigidity that foamcare and coroplast don't have. All out boards are printed directly onto the subtrate, which will give you a suprior looking product, and keep the cost down. While most real estate signs are made of coroplast, let us quote your next sign on Sintra and you will see the benefits to using this product. Producing custom banners is part of what we do for our clients. 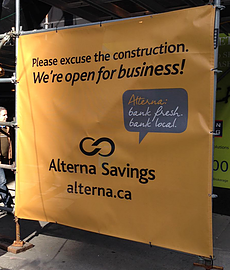 One particular client, Alterna Savings asked us to measure, produce and install these banners to some scaffolding sitting on the outside of their builing at Bay & College. We got it all done in less then 3 days. 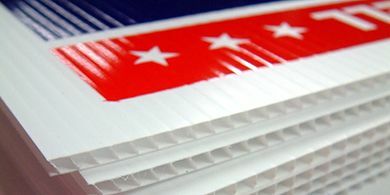 If you have any type of dye sublimation projects or need to use a mesh materials for wind purposes, talk us us and we can tailor something specifically to what you need.